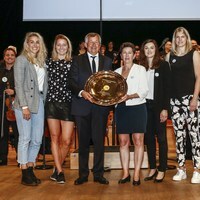 NEWS: It was a star-studded event full of "Handballissime" moments, as the preliminary round groups for the Women's EHF EURO 2018 in France were drawn in the heart of Paris on Tuesday. It was a star-studded event full of "Handballissime" moments, as the preliminary round groups for the Women's EHF EURO 2018 in France (29 November to 16 December) were drawn at the 'Maison de la Radio' in the heart of Paris on Tuesday. The 'lucky hands' at the draw belonged to Norway goalkeeper Silje Solberg, Denmark's right back Line Jorgensen, the Netherland's left back Jessy Kramer and France right wing Blandine Dancette. They drew the 16 participating nations into the following groups. Group A is played in Nantes, group B in Nancy, group C in Montbéliard and group D in Brest. The first three teams of each group qualify for the event's main round which will take place in Nantes (for teams from A and B) and Nancy (for teams from C and D). The final weekend with semi-finals and the final takes place in Paris from 14 to 16 December. Compared to previous Women's EHF EURO events, there are two major changes at France 2018. The final tournament will start on 29 November with a match featuring hosts France against 2016 Olympic champions Russia at 21:00 hrs in Group B as the event’s official opener. Matches then have been scheduled for 18:00 and 21:00 hrs respectively on weekdays and for 15:00 and 18:00 hrs respectively on the weekend in the preliminary round. The same match schedule applies to the main round. On days when three matches are being played, the first match starts at 15:45 hrs, the second at 18:00 hrs and the third at 21:00 hrs. The semi-finals take place on Friday, 14 December at 18:00 and 21:00 hrs in Paris; the match for third place throws off at 15:00 hrs on Sunday, 16 December, the final at 18:00 hrs the same day. The longer gap between the matches allows for the sale of individual match tickets rather than tickets that are valid for the entire day as in previous EHF EUROs. The organising committee has hence implemented a 'one match = one session' ticket strategy. Around nine months after the first ticket went on sale, 30 % of all tickets available, including more than 6,000 for the final, have been sold. Tickets can be bought on the official website, www.ehf-euro.com. The Women's EHF EURO 2018 in France is also the first women's event which is played with an extended main round, with only two matches per playing day apart from the last match day in each group on which all teams will be in action. The draw featured performances by the Philharmonie de Paris which played, among others, 'In the Hall of the Mountain King' by Norwegian composer Edvard Grieg. This song is the EHF EURO's official music and will be played by the Démos orchestra of the Philharmonie de Paris at the Women's EHF EURO 2018. Démos is a socially-oriented musical and orchestral education project launched in 2010 by the Philharmonie de Paris. Currently more than 3,000 children aged 7 to 12 years play in some 30 orchestras across France. Furthermore, the final tournament draw saw the launch of a new EHF campaign which features several top players and has the objective to show and empower female leadership and competence as well as inspire players for top level handball and post-career steps within the sport. In a first step, a video named 'Handball inspires generations' has been published and distributed, among others, to all EHF member federations. This video includes Dutch international goalkeeper Tess Wester, Danish international Line Jorgensen, Swedish international and EHF EURO 2014 MVP Bella Gullden, French players Amandine Leynaud and Camille Ayglon Saurina as well as Edina Szabo Borsos, coach of Hungarian club side Erd. Over the coming months, they will appear in a variety of promotion activities, online and at matches (i.e. national team friendlies and matches of the Women's EHF Champions League), in the lead-up and linked to the Women's EHF EURO 2018 (29 November to 16 December). More than ever, the EHF EURO 2018 promises to be "Handballissime".